As most cat owners are aware, the typical mild mannered kitty can do considerable damage to a house with his claws. Scratching a large, upright structure is innate behavior - scratching a tree served the purpose for the wild ancestor of cats; cats scratching furniture is the equivalent for the more urbanized feline. While declawing may be a justifiable means of dealing with destructive scratching where the cat's future in the home is threatened, many cat owners want to consider this option only as a last resort. By having some understanding of the behavioral attraction of cats to certain scratching areas, one may prevent, or even resolve cat furniture scratching problems. A scratched item such as an indoor tree, a piece of furniture or a scratching post becomes a personal territorial marker of the cat, because the scratched appearance is readily visible to other cats who might be in the vicinity. In the process of scratching, cats also rub secretions from glands in the feet onto the scratched object, giving it a distinct smell that can probably be recognized by other cats. These "smell" marks dissipate with time, and cats must regularly renew the biochemical marks. Scratching also has a function of conditioning the claws. Claws are not sharpened as a knife would be sharpener, but are "conditioned" - frayed and worn outer claws are removed to expose new, sharp claws. The first step in resolving or preventing a furniture scratching problem is to recognize that scratching is normal, and cats need an acceptable area to scratch. Three principles should be kept in mind: 1) Once a cat starts scratching an object she tends to return to it; 2) prominent objects - which make the best territorial markers - are favored, and 3) the texture of a potential scratching area influences whether it is used or not. 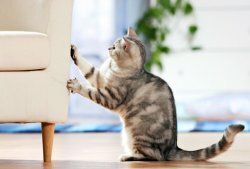 If you notice that a cat has begun scratching a piece of furniture, the furniture should be covered immediately to prevent further scratching, and it should be kept covered until the cat is regularly scratching an acceptable object. When encouraging a cat to use a scratching post, the post should first be placed in a prominent area; after it is being used it can be moved gradually to the side of the room, because cats tend to use the same object repeatedly. The importance of texture is illustrated by the popular, commercially available corrugated cardboard scratching boards that attract cats even when the boards are placed in a horizontal position. Most commercial scratching posts are covered with carpet, which although durable, does not allow the cat to drag her claws easily downward. In order to keep your cat's scratching activities directed to the acceptable scratching object, do not replace a heavily used object as soon as it gets scruffy, thinking the cat wants a new one - its heavy use is your sign the cat loves the scratching post just the way it is. For further questions about your cat's scratching behavior, feel free to contact our veterinarian or friendly staff members at our animal hospital.